To Cite: Mirghafourvand M, Mohammad Alizadeh Charandabi S, Hakimi S, Khodaie L, Galeshi M. The Effect of Orange Peel Essential Oil on Postpartum Depression and Anxiety: A Randomized Controlled Clinical Trial, Iran Red Crescent Med J. 2017 ; 19(2):e30298. doi: 10.5812/ircmj.30298. Background: Mothers are vulnerable to mental disorders, such as depression and anxiety, in the 6-week postpartum period after delivery. Objectives: This study was performed to determine the potential effect of orange peel essential oil on postpartum depression and anxiety. Patients and Methods: This double-blind randomized controlled clinical trial consisted of 96 postpartum women. Qualified samples were assigned to intervention and control groups using randomized blocking. The intervention group drank a glass of water containing 10 drops of orange peel essential oil, and the control group drank a glass a water containing 10 drops of placebo, 3 times a day, after each meal for 8 weeks. The subjects completed depression and anxiety questionnaires before and after the intervention. A general linear model was used to analyze the data. Results: There was no statistically significant difference between the groups in terms of sociodemographic characteristics and depression and anxiety scores before and after the intervention (P > 0.05). At the end of the 8th week, the mean depression score (standard deviation [SD]) was 6.7 (4.7) in the orange peel essential oil group and 6.7 (4.9) in the placebo group (P = 0.956). The mean state anxiety score was 47.6 (3.8) in the orange peel essential oil group and 48.4 (4.1) in the placebo group (P = 0.197). The mean trait anxiety score was 45.6 (3.5) in the orange peel essential oil group and 45.9 (3.8) in the placebo group (P = 0.726). Conclusions: Orange peel essential oil did not reduce postpartum depression and anxiety. There is a stage during the lifetime of each woman that strongly influences her life, including pregnancy and the postpartum period, which are followed by very important physiological and psychological changes; sometimes, these are followed by the joy of motherhood, as well as pathological changes (1). In the postpartum period, particularly the first 6 weeks, mothers are vulnerable to mental disorders (2, 3). The postpartum is a transitional period when a mother is faced with new roles, patterns, and communications, which should be adapted with them (4). During this period, they may be more disposed to develop emotional and mood crises, such as depression, because of losing energy resulted from fatigue (5), drug effects, and problems created during childbirth (6). Many women (10% - 15%) experience postpartum depression (7). The total prevalence of depression in Iran was reported to be 25% (8). Postpartum depression has terrible effects on the mother, child, and all the family (9). For example, it may result in the inability of a mother to provide obtain proper care to her children and give rise to the risk of suicide or infanticide. The long-term effects include permanent depression, marital conflicts and problems, mother-child relationship problems, and growth and development disorders in children (10). In terms of the failure to recognize and treat postpartum depression, 0.1% - 0.2 % of women will experience postpartum psychosis (11). Anxiety is an unpleasant emotion, followed by feelings of anxiousness, sadness, excitement, tension, and fear (12). Postpartum anxiety is more common than postpartum depression, and its prevalence is more than 30% in the first month after childbirth (13). If anxiety is left untreated, anxiety disorder can occur, increasing the risk of postpartum depression (14). Treatments for depression and anxiety include tricyclic antidepressants, selective serotonin reuptake inhibitors (SSRIs) (15), bupropion, duloxetine, venlafaxine, and nefazodone (16). Using antidepressant has unfamiliar effects during breastfeeding and the American Academy of Pediatrics specialists has expressed the danger of using these medicines by breast-feeding mothers (17). Antidepressant medicines can be transferred to the child by breastfeeding (18) and along therapeutic effects it will cause side effects, such as drowsiness, dizziness, hypotension, tachycardia, and possible infant adjustment disorder (19). Orange or Citrus sinensis contains limonene (20), linalyl acetate, terpene alcohol (21), phenolic acid, flavonoids (22), citral, carotene, and pectin (23). Calming effects of C. sinensis on the central nervous system and mood improvement effects (24), in addition to antidiarrheal, anti-inflammatory (25), antibacterial (26), antifungal (27), and antioxidant (28) effects, have been reported. C. sinensis is also thought to adjust the homeostasis by modifying immunosuppressants resulted by tension. Given that neuroendocrine and immune system functions play critical roles in the development of psychological diseases, such as anxiety, depression, and psychosomatic disorders, it seems the mentioned modification would be effective to treat mentioned disorders (29). Alternative medicine is very common today, and the U.S. food and drug administration has recognized orange peel essential oil as a safe group A medicine (30). Regarding the side effects of antidepression medications, close relationship between the physical and mental health of the mother and child (12, 31), unpleasant consequences of mother’s inability to communicate with her baby on its cognitive (32), social and emotional abilities development (33). As noted above, in the postpartum period, especially the first 6 weeks after delivery, mothers are at risk of developing mental disorders, such as depression and anxiety. This study was performed to determine the potential effect of orange peel essential oil on postpartum depression and anxiety. This study was a double-blind randomized controlled clinical trial of 96 nondepressed (a score of less than 12 on the Edinburg scale) postpartum women aged 18 years old and older who had delivered during the previous 48 h. The inclusion criteria were as follows: a resident of Tabriz, literate, nulliparous or multiparous, vaginal birth or cesarean section, recent low-risk pregnancy, agreed to participate in the study, and having cure profile in the nearest health care center of resident area. The exclusion criteria were: low blood pressure, depression before delivery based on the mother’s demeanor, stillbirth, death, hospitalization of the neonate in the intensive care unit, or hospitalization of the mother due to postpartum complications. Additional exclusion criteria were a traumatic history (e.g., death or hospitalization of a family member or divorce during the previous 3 months), a prior history of depression or any other mental disorder, no landline number or cell phone number, change of address during the study, recurrent miscarriage, and infertility. The required sample size was calculated as 44 individuals in each group based on information in the study by Zahraee et al. (34) using GPower software regarding depression score mean before intervention (m1 = 12.6) and with assumption of 20% reduction in the depression score mean resulted by intervention (m2 = 10.08), β = 0.2, α = 0.05, sd1=sd2=4.7, which assuming a 10% possible dropout rate, was considered 48 samples for each group. Prior to the sampling, this research project was approved by the research committee of the Tabriz University of Medical Sciences and by the ethics committee of this university (ethic code: 93114). The study was registered in the Iranian registration system (IRCT2014101210324N21). The study took place at two hospitals affiliated to Tabriz University of Medical Sciences (Al-Zahra and Taleghani) and one hospital affiliated to the social security organization (29 Bahman). Al-Zahra hospital is a specialized referral center in the northwest of the country. This hospital provides services in fields of obstetrics and gynecology, oncology, neonatal, and perinatalogy. The hospital has 150 beds and 6 operating rooms. Taleghani hospital is a general 98-bed hospital, which provides various services, including general surgery, NICU, neonatal, delivery, obstetrics and gynecology. It also cares for patients with high-risk pregnancies. 29 Bahman hospital has 85 beds. It offers inpatient hospital surgery and has obstetrics and gynecology, pediatrics, NICU, nephrology, general surgery, operating rooms, delivery, emergency, and dialysis wards. All postpartum women aged 18 years old or older were assessed in the selected hospitals, based on the eligibility criteria. When a patient met the criteria, written informed consent was obtained. All the participants completed the Edinburg postpartum depression questionnaire. A score of 12 and higher indicated the probability of depression, and the patient was referred to a mental health services provider for appropriate care. In cases with scores lower than 12, sociodemographic information was obtained from the patients, and they all completed the Spielberger anxiety questionnaire. 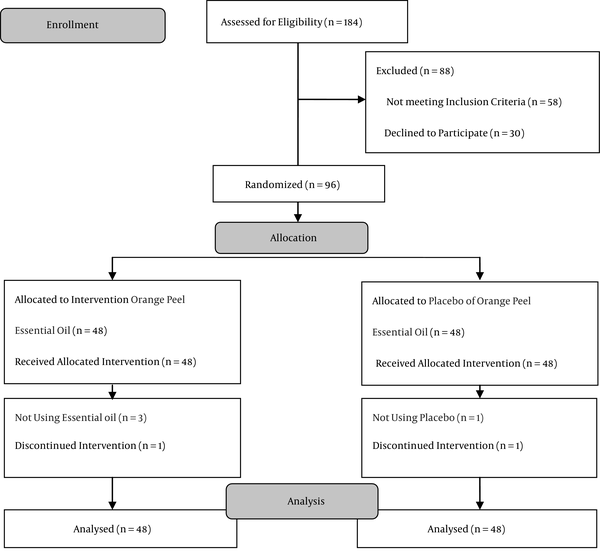 Using block randomization with four and six blocks and an allocation ratio of 1: 1, the selected subjects were assigned to two groups: an intervention group, which received the orange peel essential oil, and a control group, which received a placebo. Similar glasses of placebo or orange peel essential oil were stored and sealed in opaque envelops with sequential numbers. The orange peel essential oil and placebo had exactly the same appearance (smell, color, and shape). For the preparation of the intervention, 18 mL drops of orange peel essential oil with active ingredients of flandren, limonene, and citral based on the presence of at least 18 mg of limonene per ml of standardized product were obtained directly from the Barij essence Pharmaceutical Company. To prepare the placebo, 20 mL hygienic glass containers containing a dropper (same size and color and similar to the containers containing the orange peel essential oil) were prepared and filled with water and propylene glycol (a very low percentage). To equalize the odor of the orange peel essential oil and placebo, 1 - 2 drops of orange edible essential oil were used, without additional effects. The labels on the original drugs and placebos were similar. The orange peel essential oil or placebo was administered in 10 drops, 3 times a day (after each meal) in a glass of water. To ensure the use of the intervention, the participants were followed up by phone 2 and 5 weeks after the commencement of the study. All the patients completed sociodemographic and obstetrics questionnaires and depression and anxiety questionnaires before and 8 weeks after the intervention. The sociodemographic and obstetrics questionnaire contained a range of questions, such as the patient’s age, wife and spouse’s educational level, occupations, weights, heights, gravidity and parity, abortion history, type of pregnancy and childbirth, and support provided by the spouse and family. The Edinburg postnatal depression questionnaire was developed by Cox et al. (35) in 1978 and revised in 1994. The scale consists of 10 questions, with depression classified as low to high intensity in some questions (1, 2, and 4) and high to low in others (3, 5, 6, 7, 8, 9, and 10). Each question has 0 - 3 points, with a possible total of 0 - 30 points. Individuals based their answers on emotions felt during the previous week. A score of 12 points or higher was considered a probable sign of depression. The spielberger state-trait anxiety inventory (STAI) includes 40 self-report questions. The first 20 items measure state anxiety (how a person feels at the moment), and the second 20 items measure trait anxiety (how a person generally feels). State trait anxiety is ranked using a Likert scale as very low (1), low (2), high (3), or very high (4). Trait anxiety is ranked according to a Likert scale as almost never (1), sometimes (2), often (3), and almost always (4). The total score on each scale is around 20 - 80 points. This questionnaire was validated by Mahram, and the Cronbach’s alpha was reported to be 0.91 (36). The data were analyzed using SPSS, version18 software. The normality of quantitative data was assessed by the Kolmogorov-Smirnov test and found to be normal. Chi-square, chi-square for trend, independent t, and Fisher’s exact tests were used to assess the homology of the groups in term of sociodemographic and obstetrics characteristics. An independent t-test was used to compare the mean scores of depression, trait anxiety, and state anxiety before the intervention between the groups, and a repeated measures analysis was used after the intervention, with adjustment of the baseline scores. The level of significance was considered as 0.05 in all the analyses. The participants were recruited from 22 October 2014 to 20 December 2014, and follow-up ended on 24 February 2015. The initial screening consisted of 184 patients. Of those, 58 were excluded because of ineligibility, and 30 did not wish to participate in the study. Thus, 48 participants were allocated to each group, and they were followed until the end of the 8th week after the intervention (Figure 1). There were no statistically significant between-group differences in sociodemographic and obstetrics characteristics (Table 1). The mean (SD) age of the participants was 28.5 (5.8) years. About half of the women (47.9%) had a diploma. The majority (92.7%) were housewives. The income level of about one-fifth (22%) of the participants was satisfactory. Around one-third (32%) of pregnancies were unplanned, and 4.8% of women reported that they had little support from their husbands. aThe data are reported as means (SD). Before the intervention, the mean depression score (SD) was 8.0 (3.6) in the orange peel essential oil group and 8.1 (3.3) in the placebo group. At the end of the 8th week, it was 6.7 (4.7) in the orange peel essential oil group and 6.7 (4.9) in the placebo group. There was no statistically significant difference between the groups before and after the intervention when adjusting for the baseline score (adjusted mean difference: 0.5; 95% CI: -1.6 - 1.7; P = 0.275 and P = 0.956, respectively) (Figure 2 and Table 2). The state anxiety score mean (SD) was 47.9 (5.3) and 49.2 (5.3) in the orange peel essential oil and placebo groups, respectively, before the intervention. At the end of the 8th week, it was 47.6 (3.8) in the orange peel essential oil group and 48.4 (4.1) in the placebo group. There was no statistically significant difference between the groups before and after the intervention when adjusting for the baseline score (adjusted mean difference: 0.4; 95% CI: -1.0–1.9; P= 0.821 and P = 0.197, respectively) (Figure 2 and Table 2). The mean (SD) of the trait anxiety score before the intervention was 46.6 (3.5) in the orange peel essential oil group and 45.6 (4.7) in the placebo group. At the end of the 8th week, it was 45.6 (3.5) in the orange peel essential oil group and 45.9 (3.8) in the placebo group. Thus, there was no statistically significant difference between the groups before and after the intervention when adjusting for the baseline score (adjusted mean difference: 0.6; 95% CI: -0.5 - 1.9; P = 0.469 and P = 0.726, respectively) (Figure 2 and Table 2). As reported by the women, the level of recovery was fine in 53.1% of cases, and the rate of satisfaction was fine in 56.3% of cases. The side effects reported by the women in the placebo group included dizziness (2.1%), heart palpitations (8.3%), and nausea (4.2%). The side effects in the orange peel essential oil group included dizziness (6.3%) and increased urination (10.4 %). The results of the present study indicated that the use of orange peel essential oil had no effects on postpartum depression and anxiety. These results are similar to those obtained in a previous study of emergency department waiting room stress that investigated whether music or aromatherapy could improve anxiety scores (37). In a study of dental patients, patients exposed to the smell of orange or lavender had lower rates of anxiety, higher rates of positive mood, and higher rates of calmness than patients in a control group (38). However, that study considered only the effect of orange essence on trait anxiety, and the effects on state anxiety and depression were not clear. Based on a study on healthy individuals, Hongratanaworakit et al. (39) concluded that the use of orange peel essential oil in aromatherapy was effective in reducing stress and mild depression. It seems that likely the mismatch occurred because the mentioned study has not been assessed depression or anxiety but evaluated some behavioral factors, such as capability, relaxation, attention, mood, and consciousness, using VAS scales (39). In a study of adult male mice, orange essence had antipanic (anxiolytic) and sedative (tranquilizer) effects, although the researchers concluded that further clinical research was needed to determine the meaningfulness of recommended treatment (40). A clinical trial of the effect of essential oil of C. sinensis in the treatment of premenstrual syndrome in 80 Iranian students concluded that orange peel essence had the highest effect among premenstrual syndrome symptoms on its emotional symptoms through its effects to stimulate the central nervous system and enhance the mood (24). The results of the aforementioned studies are not in accordance with the results of the present study. The discord may be attributed to its combinations, used essence density, and also because of its usage method, which has been used as aromatherapy in most studies. The orange essence used in the current study included 95% of effective substances as limonene, phellandrene and citral that was at least 18 mg of limonene per ml of standardized product. In the other studies, the orange essence contained 95.3% limonene and 1.88% mirsin (38) or 98% monoterpene limonene (39). In common with the findings of an earlier study (24), no serious side effects were reported in this study following the use of orange peel essence. The side effects that were reported were mild and transient. With regard to the limitations of this study, ensuring the accuracy of the answers was beyond the scope of this research, and all the responses given by the mothers were assumed to be representative of their experiences. Another limitation was the make-up of the study group, with most of the participants being housewives. Thus, the results of this study cannot be generalized to women who are employed outside the home. The strong points of this study were the careful and continuous follow-up and the fact that this was the first clinical trial of the effects of orange peel essential oil on depression and anxiety in postpartum women. Based on the results of the present study, using orange peel essential oil has no effect on postpartum depression and anxiety. Further studies should assess the effect of different doses of orange peel essential oil in different populations and women with postpartum depression. Such studies should include longer monitoring periods to obtain more accurate results. This research was performed as part of a midwifery MSc thesis at Tabriz Nursing and Midwifery school. The assistance and cooperation of the research deputy of Tabriz University of Medical Science and that of the participants are appreciated. Authors’ Contribution: Study, concept and design: Mojgan Mirghafourvand, Sakineh Mohammad Alizadeh Charandabi, Sevil Hakimi, Laleh Khodaie, and Mina Galeshi; acquisition of the data: Mina Galeshi; analysis and interpretation of the data: Mina Galeshi, Sevil Hakimi, and Mojgan Mirghafourvand; drafting of the manuscript: Mojgan Mirghafourvand and Mina Galeshi; critical revision of the manuscript for important intellectual content: Mojgan Mirghafourvand, Sakineh Mohammad Alizadeh Charandabi, Sevil Hakimi, and Laleh Khodaie; statistical analysis: Mojgan Mirghafourvand and Sakineh Mohammad Alizadeh Charandabi; administrative, technical, and material support: Mojgan Mirghafourvand; study supervision: Mojgan Mirghafourvand, Sakineh Mohammad Alizadeh Charandabi, Sevil Hakimi, and Laleh Khodaie. Funding/Support: This study was supported by Tabriz University of Medical Sciences and administrative, technical, and material support was provided by Mojgan Mirghafourvand.